HALF SIZE SBC – our industrial half size PCI express, PISA, PCI, and ISA single board computers are equipped with Core 2 Duo, Pentium M, Pentium 4, Celeron D, Celeron M, and Pentium III CPU support. Offered in three different formats – the PICOe SBC, the PISA SBC, and the ISA SBC – these single board computers provide centralized utilities within a smaller, more compact design. The PICOe is a computer form factor that offers a half-sized card slot single board computer, which is inserted into a gold fingers card slot connected to an active backplane or a passive backplane. Expansion peripherals of the computer system may also be connected to varying slots of the backplane. 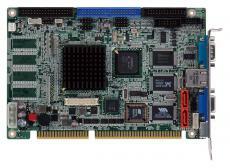 PICOe single board computers offer one PCI bus, as well as multiple PCI Express buses that vary in configurable widths and offer dual faceted interfaces along with other devices connected to the backplane. 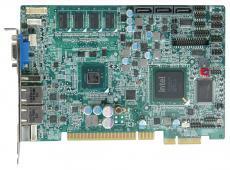 The backplane also serves as the power source for the PICOe half size single board computer and its peripheral expansion cards. The PICOe SBC computer card slot employs a singular connector footprint equipped with stepped connector depths in order to establish and maintain physical stability in the slot, for ruggedization reasons. Additional card slots connected to the backplane may be standard conventional PCI as well as PCI connectors. Additional half size SBC formats offered by ICP America include PISA and ISA half size single board computers.